Independent hotel and venue company Cairn Group has announced it will open The Birmingham Conference & Events Centre (BCEC) this autumn. Located on Hill Street in the heart of the city’s rejuvenated centre, BCEC has a fully-flexible events space over two floors, spanning 2000sqm. 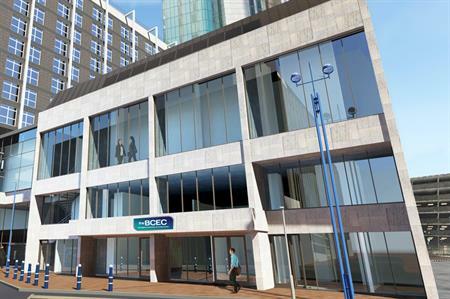 Designed by Street Design Partnership of Manchester, the BCEC is on the doorstep of Birmingham New Street station, offering good connections to Birmingham Airport and other parts of the UK. The building comprises 20 conference rooms which can accommodate up to 1,450 delegates, as well as six banqueting suites, which can accommodate between 30 and 750 guests. In addition the venue is equipped with high-spec audio-visual, technical equipment and state-of-the-art kitchens for large-scale catering. Vincent Garrington, general manager of the BCEC, said: "We’re delighted to officially announce the opening of the Birmingham Conference & Events Centre. The venue brings a major new event and exhibition space to the heart of the city and is proving to be a very attractive proposition for local, national and even global companies and organisations. Already we have secured a number of bookings and have a strong pipeline of companies looking to bring their business to the BCEC in the coming months."